You will have a hard time leaving this little slice of heaven. This stunning 2 Bedroom, 2 Bath first floor corner unit has just been completely renovated and decorated. 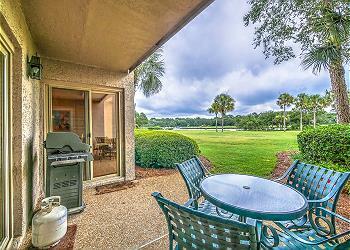 Fabulous views of Braddock Cove abound from your private patio! The kitchen was opened up to allow for a spacious open floor plan. This villa has had significant upgrades including all new tile floors, new granite counters in the kitchen, new stainless- steel appliance and new furnishings and bedding throughout. The bathrooms have both been remodeled to include granite counters, new fixtures, new tile and a beautiful walk-in shower in the master bathroom. It’s almost too pretty to believe! Dine al fresco or sip on your morning coffee while enjoying the amazing views of Braddock Cove from your patio. 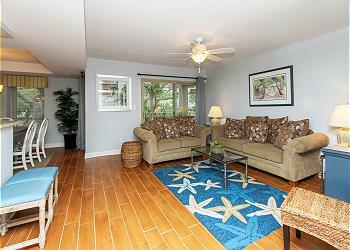 Bluff Villas are located in the center of South Beach between Calibogue Sound and the Braddock Cove inlet. 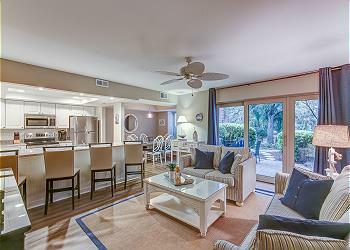 Walk easily to South Beach Marina, community pool, playground, racquet club, dining, shopping, and activities. This is a favorite area for watersports enthusiasts.